According to the 2015 EU Ageing Report, demographic ageing in European population will change dramatically over the coming decades. The percentage of citizens aged over 65 years is predicted to rise from 18% in 2013 to 28% by 2060 and the percentage of people aged 80+ will increase from 5% to 12% during the same time period. Frailty is considered as one of the most complex and important issues associated with ageing. It is considered as a condition of diminished physiological reserves, that put the individual to a greater risk of a less efficient response and functional recuperation in case of exposure to stress and thus adverse health outcomes (e.g. hospitalisation, fall, disability). The syndrome has significant repercussions on the older persons’ quality of life and on the health care system1. The relationship between frailty and a higher risk of falling, loss of functional independence, reduced quality of life, institutionalization, and mortality2, 3, has been well-documented. Frailty is not an inevitable consequence of ageing. In many cases it can be pertinently managed and its evolution can be delayed or even postponed; thus a stronger focus on early screening and detection of frailty is needed for timely management4 and prevention of loss of autonomy. 1 Frailty in older adults: evidence for a phenotype. Fried LP, Tangen CM, Walston J, Newman AB, Hirsch C, Gottdiener J, Seeman T, Tracy R, Kop WJ, Burke G, McBurnie MA, Cardiovascular Health Study Collaborative Research Group. J Gerontol A Biol Sci Med Sci. 2001 Mar; 56(3):M146-56. 2 Frailty and risk of falls, fracture, and mortality in older women: the study of osteoporotic fractures. Ensrud KE, Ewing SK, Taylor BC, Fink HA, Stone KL, Cauley JA, Tracy JK, Hochberg MC, Rodondi N, Cawthon PM, Study of Osteoporotic Fractures Research Group. J Gerontol A Biol Sci Med Sci. 2007 Jul; 62(7):744-51. 3 Psychological well-being and incident frailty in men and women: the English Longitudinal Study of Ageing. Gale CR, Cooper C, Deary IJ, Aihie Sayer A Psychol Med. 2014 Mar; 44(4):697-706. EU FrailSafe offers an integrated assessment system, using cutting-edge technology. The solution estimates people’s frailty level and locates a person’s weakness in order to provide personalized suggestions. It also provides a health monitoring tool and has the potential to generate real-time notifications in case of adverse events. The solution complements traditional clinical assessments in identifying those at higher risk of developing adverse health events, and thus facilitating comprehensive integrated care plans for older people. The developed system collects and analyses data from different domains including physiological, cognitive. behavioural, psychological, social, enabling the system to estimate the frailty level of a person. It generates a virtual patient model (VPM) that reflects a person’s current health status and suggests personalised frailty preventive interventions. Alongside this process, health care professionals can visualize their patients’ health data through the EU FrailSafe Platform and take actions if deemed necessary. Not only health professionals but also older individuals themselves and their authorized family members can view their data through the Platform’s dashboard and therefore monitor different parameters of their own health. Click here to have an insight in the technical system. Why should you use the EU FrailSafe Solution? Older people can use the platform to have an overview of their health data collected in real-time. They can visualize data related to their current health status and act, where necessary, to strengthen the spotted weakness thanks to the personalized recommendations. This enables them to remain independent, active and maintain their quality of life as long as possible by adopting a preventive approach. Moreover, the system also enables informal carers to remotely monitor relevant variables (such as physiological measurements) and alert them of any deviations.. It can empower prefrail individuals in their homes and communities, increasing their autonomies, and consequently also the informal carers’ quality of life. Finally, health professionals can also be given access to the medical data of their patients and will thus be able to monitor the older person’s progress and provide them with a comprehensive care pathway. Click here to see an interview with an older person on the importance of prevention. Click here to read an interview with the Executive Director of Eurocarers, an NGO representing informal caregivers. 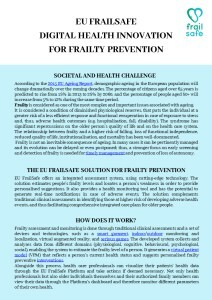 Frailty evaluation and management is a challenge in geriatrics. Nowadays, health professionals are limited in monitoring the evolution of frailty and above all, detecting frailty accurately, efficiently and early enough so older people can preserve their functional autonomy as long as possible. 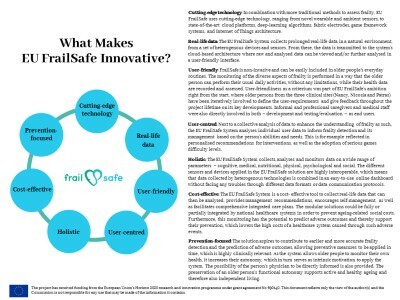 Considering the abovementioned challenges, the FrailSafe solution supports medical professionals in detecting frailty earlier using a more accurate and comprehensive approach, allowing for preventive measures to be applied in time and delaying the onset of frailty among their older patients. Finally, by having access to their patients’ real-time daily data and their medical history, medical professionals are able to better adapt their treatments. Click here to listen to how the FrailSafe solution can help medical professionals. Due to the vast amount of available real-life measurements vital signals and medical data collected via the utilised devices and other clinical assessment substantial research can be conducted based on this anonymized data. This will aim at the advancement of science towards long-term detection, delay, prevention and treatment of the frailty syndrome. Data scientists, medical researchers and social workers might use the existing available data in order to uncover and design high-level theories which structurally correlate the data and propose relevant policies to prevent the consequences of frailty. In this direction, regional or national policy-makers can contribute by coupling the research results with social features and political will in order for the suggested policies to be tried in communities or regions and later be implemented as a general policy in the public domain. Listen to the interview of a former supervisor in the Social Welfare Services of the Ministry of Labour and Social Insurance in Cyprus. Healthcare institutions are looking for ways to reduce treatment costs. The EU FrailSafe solution can be applied to their patients on a regular basis for screening and evaluation purposes. The system will give healthcare organisations the opportunity to reduce monitoring and treatment costs for older people’s frailty-related diseases, increase the availability of their resources and expand their services to existing or new patients by providing high quality services. Listen to our care provider partner’s opinion on how the EU FrailSafe solution can improve their services. Pharmaceutical companies can use the EU FrailSafe solution to accompany research for frailty-related drugs or treatments from the stage of sample selection up to the final results validation. The system can help pharmaceutical companies assess their products using an innovative and reliable method. The costs of in-hospital treatment and rehabilitation for older patients are covered by their insurance company, be it public or private. Insurance companies can recommend to the use of the EU FrailSafe solution for prevention purposes to their clients. A large percentage of preventable incidents are related to frailty-related diseases, therefore it is in the insurance company’ interest to reduce these costs by using a system that detects frailty early and provides personalized prevention measures. Listen to two insurance companies experts’ opinion on how the EU FrailSafe solution can improve their services. What makes EU FrailSafe innovative?